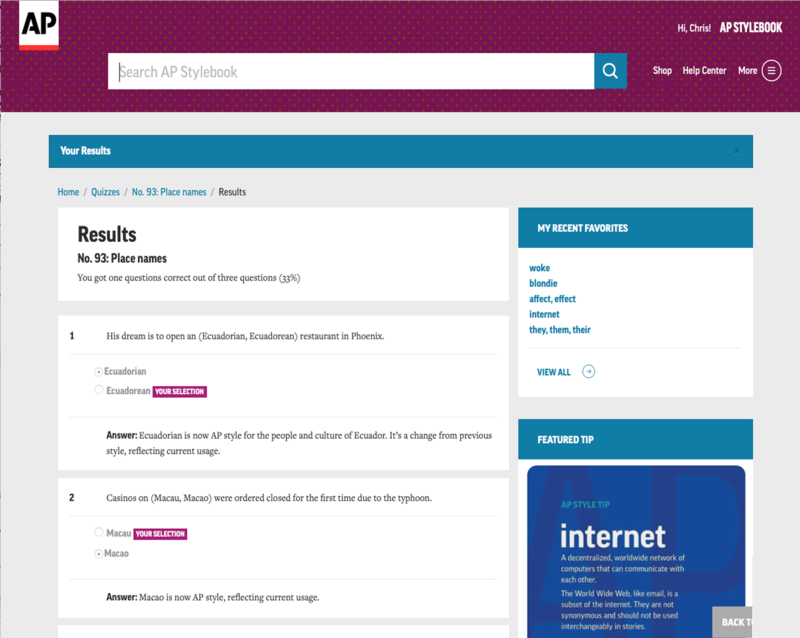 Test your knowledge of AP style and usage with dozens of quick, informative online quizzes. Take 90 multiple-choice quizzes as many times as you like. Automatic scoring won’t just tell you which of your answers were right or wrong, it will also provide an explanation of the relevant style rule so you’ll understand why the right answer is correct. 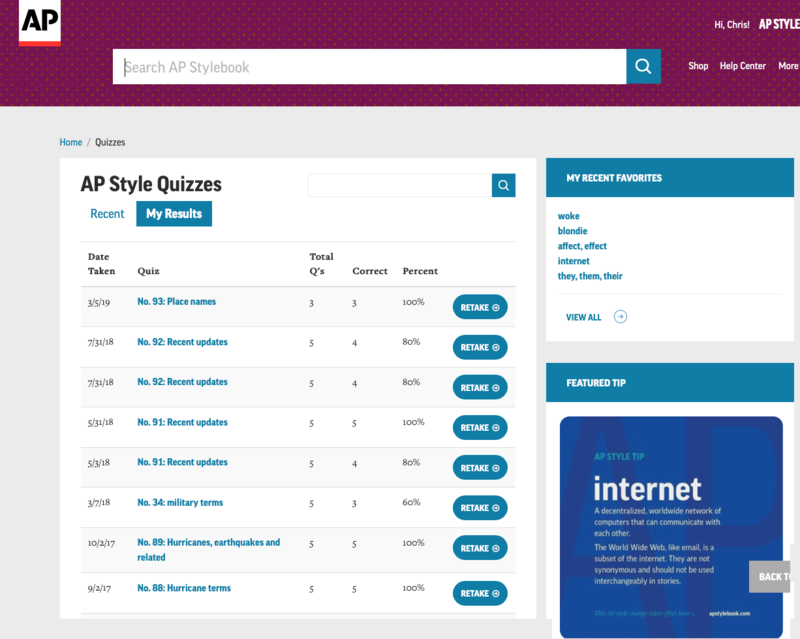 Whether you want help learning AP style for the first time or you could use a refresher, let AP Style Quizzes act as your virtual tutor. 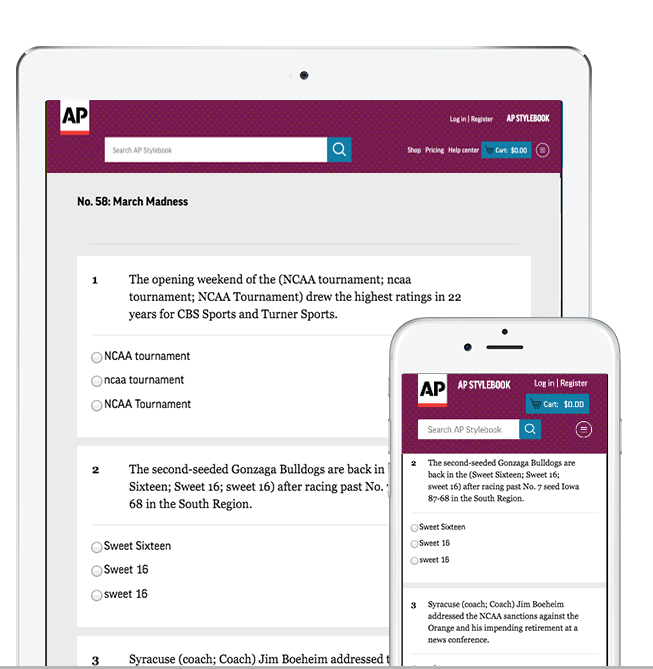 Test your knowledge of AP style and usage with 90 multiple-choice quizzes as many times as you like. Automatic scoring tells you which of your answers were right or wrong, and gives you an explanation of the relevant style rule so you’ll understand why the right answer is correct. You’ll have a record of which quizzes you have taken and which questions you missed to guide you to areas to study. Automatic scoring when you submit your answers, telling you not only which questions you answered incorrectly but the style rule that applies to each question. Records of your score on each quiz you have taken, so you can see what topics you might need to review. Ability to retake each quiz as often as you like to keep working on your style skills. Mobile optimization so you can use your subscription on your desktop, laptop, smartphone or tablet. Social media sharing on your quiz results to make it easy to brag about your style knowledge. 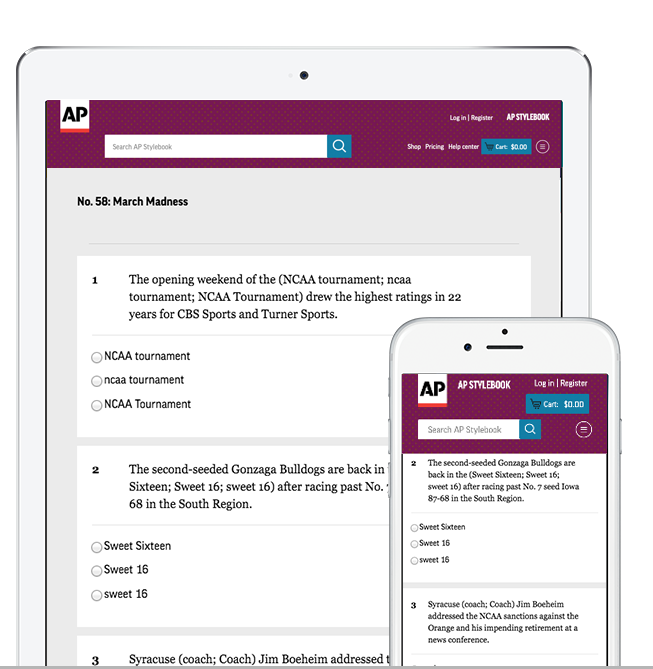 AP Style Quizzes is easy to use. It’s a web-based tool so there’s nothing to download or install. Just activate your account using the link we email you, then log in with your username and password. 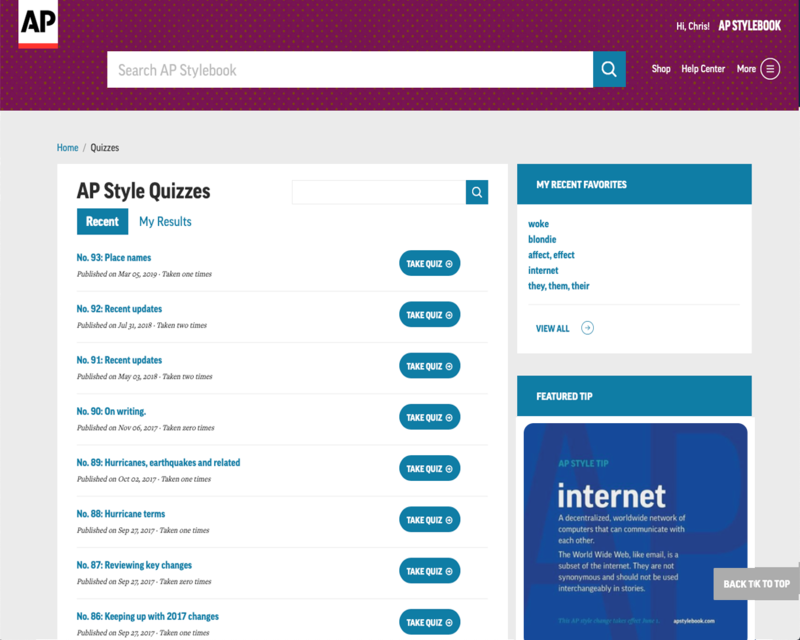 You’ll find it’s easiest to use AP Style Quizzes when you click “remember me” when you sign in. 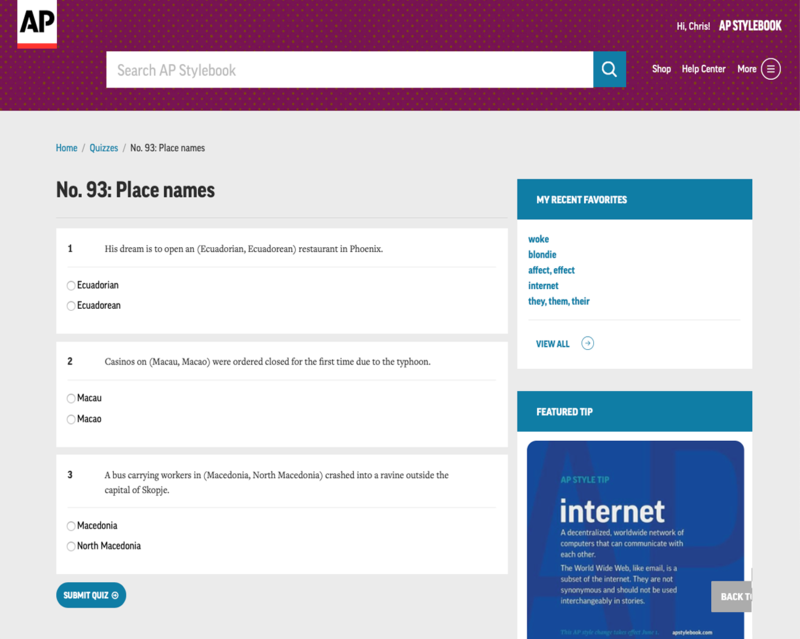 If you also have a subscription to AP Stylebook Online, you can merge your accounts so you only have to remember one username and password.